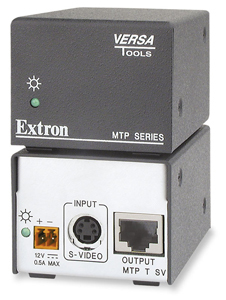 Extron MTP T SV A and MTP T SV A RCA twisted pair transmitters provide active, balanced transmission of S-video and audio signals, delivering superior image quality long distances over a single twisted pair cable. The MTP T SV A accepts balanced or unbalanced stereo audio on a 5 pole captive screw connector, while the MTP T SV A RCA model accepts unbalanced stereo audio on RCA connectors. 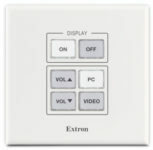 The s-video input on both models is a 4-pin mini DIN connector. The active, balanced S-video and audio signals are output to a single CAT 5, 5e, or 6 cable, and when coupled with an MTP R SV A Series receiver, the pair is capable of sending the S-video and audio signals 1,000 feet (300 meters) or more.